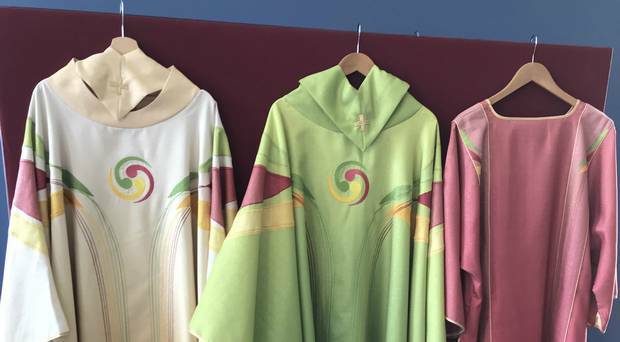 Check out these fabulous vestments that were designed specifically for the Meeting of Families in Dublin, Ireland—that is, if all of its clerical coordinators don’t end up behind bars first in the wake of the Pennsylvania Grand Jury Report. And the, um… oh, isn't that a Star Trek thing in the middle? This is the symbol of the Japanese war god, Hachiman; and you can find it also in Okinawa's bare-handed martial arts. Some readers have interpreted - and cannot be blamed - the three commas as three 6; the famous "666" of the Apocalypse. At the presentation the Irish priest who explained said that "It is the whole notion of the journey in the divine, and also in eternal life". Take a good look. Even if the caftans and muumuus aren't made of polyester, they certainly should be! And let's not forget that Father Jimmy Martin will also be there with bells on (maybe literally), probably sporting one of these colorful bad boys himself. The editor at America magazine is reportedly scheduled to speak about how parishes can develope better programs to welcome LGBTQRS Catholics and their parents into the "Catholic Christian community". Sounds enthralling! Listen, any parents claiming to be Catholic, that would send their kids to this ecclesial gay pride parade in Ireland really need to take some time off, maybe get a little therapy or something. I'd sooner send my kids on a camping trip with Van Halen.